The D.C. region sees some changes in humidity levels this week, as well as a break from strong and severe thunderstorms. WASHINGTON — By the minor technicality of the high temperature at Reagan National Airport being only 89 degrees Sunday (according to the 5:24 p.m. climate report), the heat wave that started July 17 is technically over. 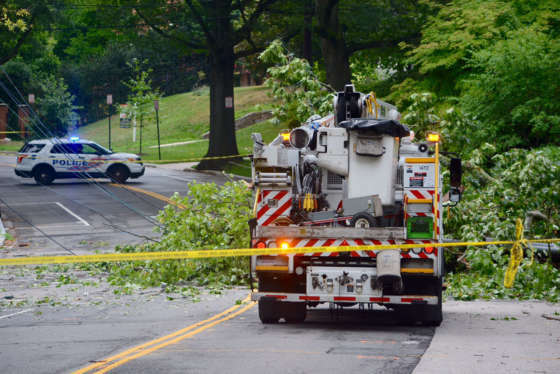 Two lines of thunderstorms rolled through the D.C. area on Saturday. See photos. In our part of the country, heat waves are defined as three or more consecutive days with high temperatures at 90 or higher. Sunday may have been a moral victory for folks who don’t like heat waves. Monday looks like we will be right back in the 90s along with continuing muggy levels of humidity, but changes are on the way for both. Along with these changes, we will all be getting a break from strong and severe thunderstorms. 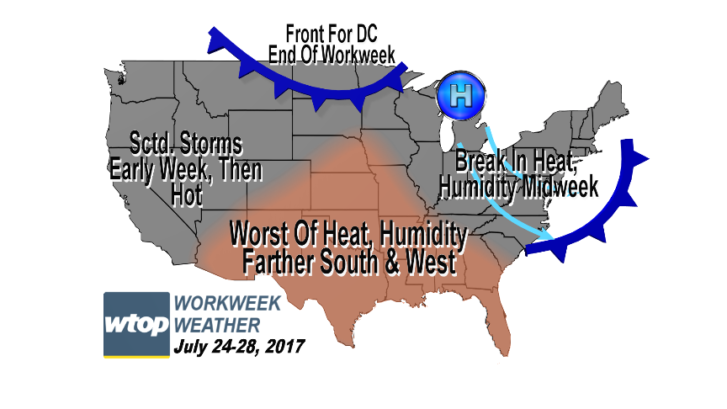 The heat and humidity will make an appearance again toward the end of the workweek before taking another break over the upcoming weekend. However, these changes will only be a matter of comparison; every day this week will still feel like summer. Monday starts with the remnants of Sunday’s thunderstorms still meandering through some parts of the area, very widely scattered and much weaker — if any remain at all. An abundantly muggy air mass remains in place, but a weak cold front will be just to the north, hung up in Pennsylvania. The front will slide through the D.C. area gradually during the day and without much fanfare. Even though the front has a more comfortable air mass behind it, the front won’t have a lot of “lift” with it. The wind direction will be generally the same and the front won’t have a significant disturbance moving along it in the winds aloft. It will appear as if the dangerous heat and high humidity will just be sort of gradually replaced during the day. Thunderstorm chances do not look like they will be very high, but Storm Team 4 radar will still be monitored for any isolated storms that could pop up, most likely in central Virginia and southern Maryland. Tuesday and Wednesday will usher in a small area of Canadian high pressure, providing that more comfortable air mass. It’s no autumn preview though: It will still be seasonably warm (borderline hot) and seasonably humid. But to that last point, it will just feel sticky, not tropical. The atmosphere will also be sinking/compressing in the center of the high pressure dome, keeping rain chances nil. That’s certainly good news for Nats fans as the team will finally be starting another homestand against the Brewers. Thursday into Friday, we will experience the old front return north as a warm front, while the high pressure system drifts east. This will increase cloud cover and chances of at least scattered thunderstorms later Thursday. Just as that’s happening, another Canadian cold front will be pushed our way by the next Canadian high pressure system. This front will lift that hot and humid atmosphere much better than Monday’s front, and that means a chance for some big storms with big rainfall amounts. However, there is some uncertainty at this point as to whether that front will make it Friday, Friday night or Saturday. There are some obvious implications for Friday evening plans when the workweek is over (for most of us), including the Rockies coming to town. • A warm, muggy, hazy start with some areas of fog, mainly in areas that got the Sunday storms. • Hot afternoon with building clouds, but only a few isolated thunderstorms possible. • Dropping humidity levels in the afternoon into the evening. • A warm start, but not as muggy as Monday morning, nor as hazy. • Very warm/hot (depending on personal preference), but seasonable. • Humidity at typically sticky levels, not feeling like the Texas Gulf Coast anymore. • Best feeling day of the week. • High temperatures possibly slightly below average. • Warmer and more humid; starting to feel uncomfortable. • A few stray thunderstorms possible later in the day. • Hazy sunshine through mostly cloudy skies. • Hot and uncomfortably humid. • Chance of late-day thunderstorms lasting into the night. Editor’s Note: The WTOP Workweek Weather Blog is intended as an in-depth yet plain language summary of the business week’s weather potential in the D.C. area along with an explanation of the contingencies and uncertainties that exist at the time of publication. For the latest actual Storm Team 4 forecast, check out the main WTOP Weather Page.